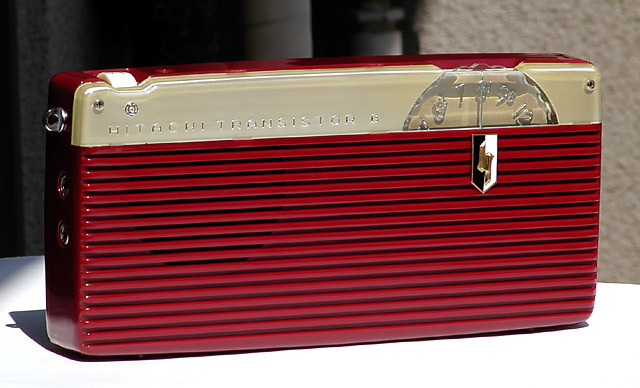 Allow me to introduce Hitachi's first transistor radio. And what a radio it is. The TH-669 went on sale in May 1957, and the sample shown on this page appears to have been built around August of the same year. There were five colours in the lineup: the scrumptious maroon you see here, midnight blue, emerald green, poppy red, and black. The price of ownership in 1957 was 17,300 yen, or about two-month's salary for a freshly employed university graduate of the day. I don't know about you but, to the bleary eyes of this crazed lad, the TH-669 has to be one of the most beautiful radios to come out of Japan in the fifties. No other Hitachi transistor set sports that fabulous cloisonne badge. The expanse of pearl-colour reverse paint running along the top and the 3D effect created within by the Hitachi name and logo highlighted in silver is to die for. And the clear tuning dial with numbers also reverse-painted in silver and resting on that bed of pearl just makes the image tastier. Yum. The cabinet is made of an expensive high-impact shockproof plastic that supposedly won't break even if dropped. Have I tested it? Are you crazy? I'll await a report from you when you drop yours to find out; thank you very much. (Why do I have a sudden craving to down a dozen peanut butter and banana sandwiches?! ).